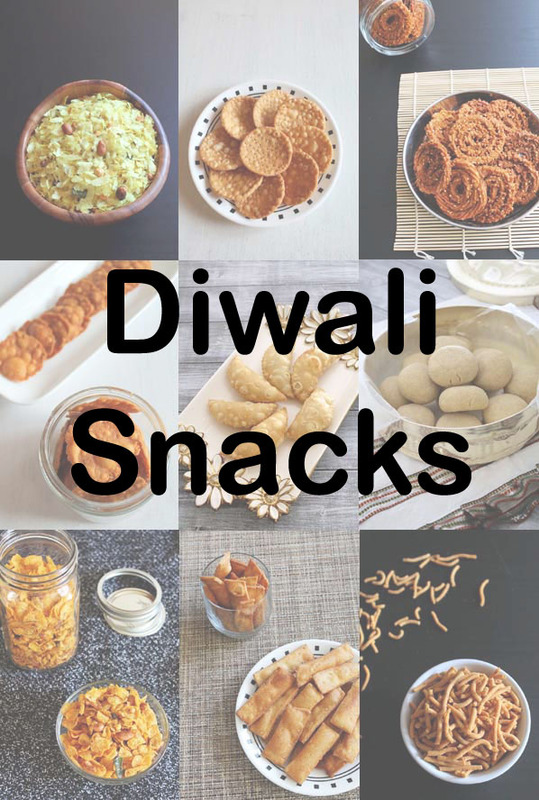 Find here the collection of different Diwali snacks recipes. Diwali or Deepavali is the biggest festival celebrated in our family. We usually start preparing for this festival around 10-15 days before. This year Diwali is on 7th Nov 2018. But the celebration starts 2 days before and lasts for five days. Wishing you a very happy Diwali in advance. My mom makes different snacks and store in big dabba and those lasts for 15-20 days. We enjoy those without worrying about calories. Also we serve these snacks to the friends and families who comes over for Diwali and new year good wishes. After marriage I have kept her tradition continue but I make very small batches because it’s for just two of us. The below listed falls in the dry or dabba snack category. These can be made ahead of time (10-15 days before) and stored in clean, airtight containers aka dabba/Jar. Make them and enjoy throughout the week celebration of Diwali. 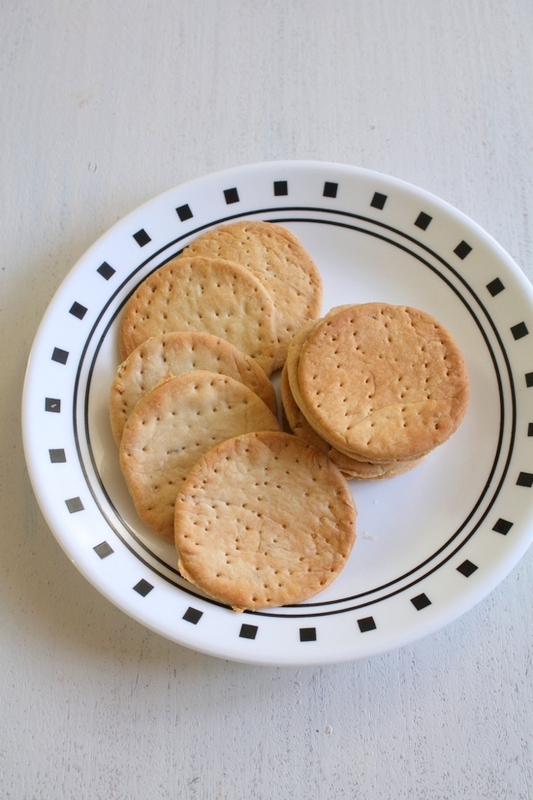 Serve them with a cut of hot tea/coffee or munch them anytime you feel like. 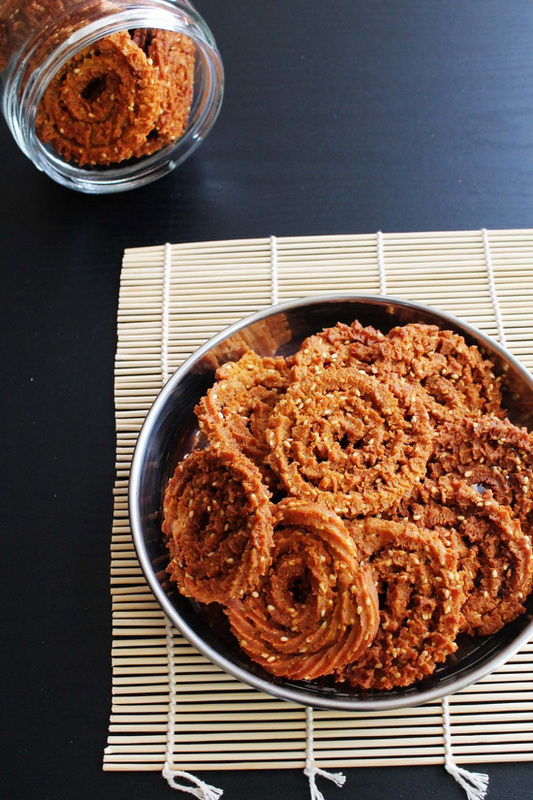 Chakli – This is Gujarati and Maharashtrian version. To make it semi-healthy I have used whole wheat flour. I am saying semi-healthy because these yummy goodies are deep fried. 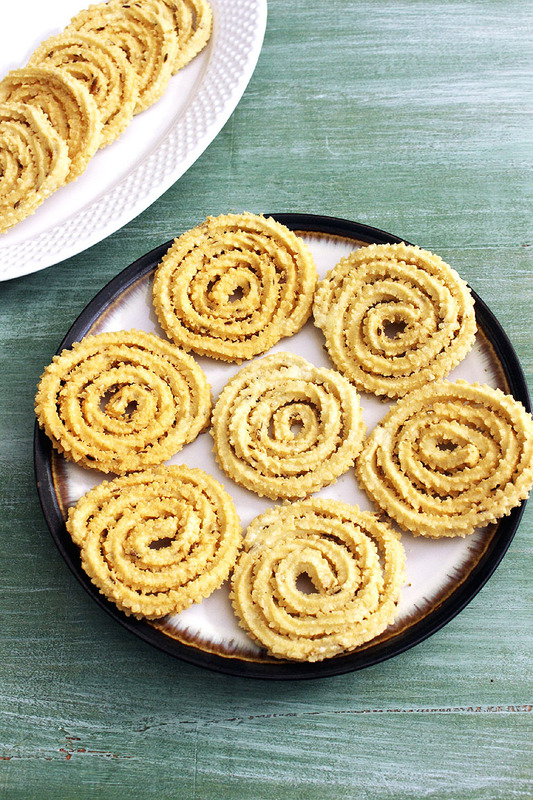 Murukku – This is South Indian version of chakli. It is made from rice flour and urad dal flour. Poha chivda – This is the fried version. Here thick variety of poha are deep fried and then mixed with nuts and spices. 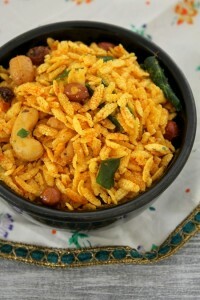 Roasted poha chivda – Now this is the healthy one because thin variety of poha are roasted with few spoons of oil only. 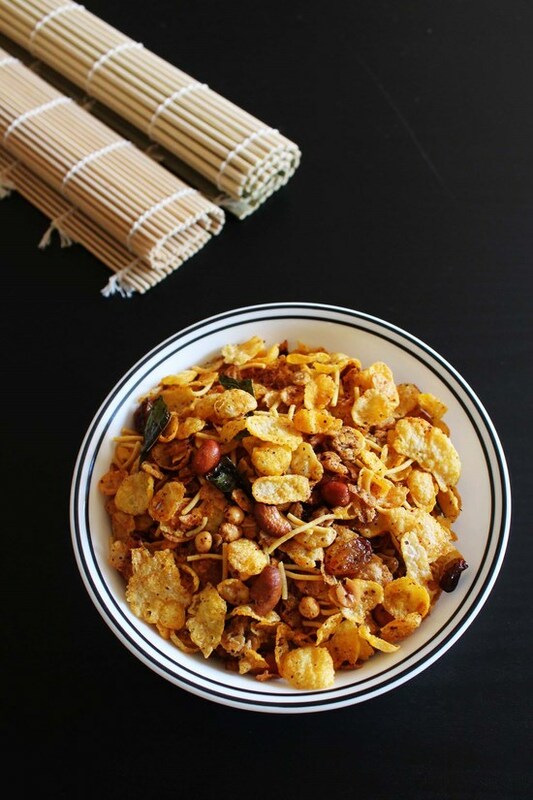 Corn flakes chivda – Traditionally it is called makai poha chivda where dry makai poha are deep fried and mixed with peanuts and spices. But to make it healthy I am using corn flakes cereal. Trust me it tastes too good. Cereal chivda – Again another healthy chivda recipe using cereal. This time I am using honey bunches of oats cereal. It is mixed with nuts, sev and spices. So yumm!!! 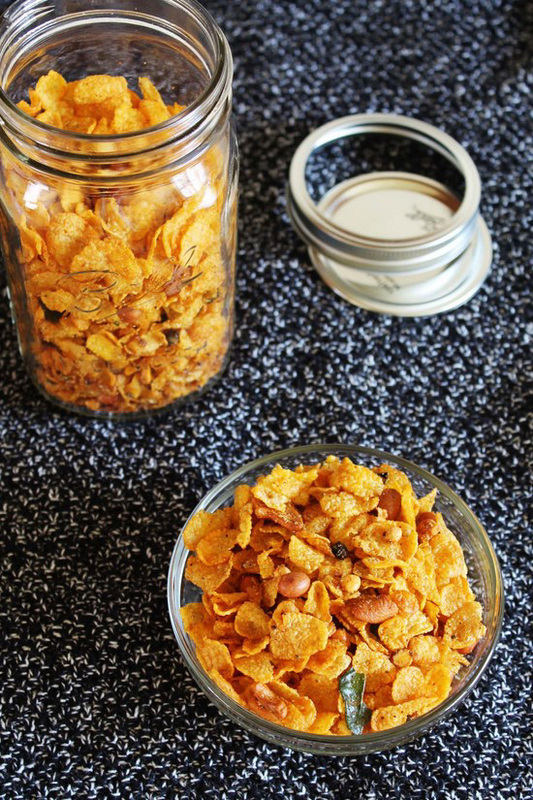 With this same method, you can use mixture of corn flakes and cheerios. 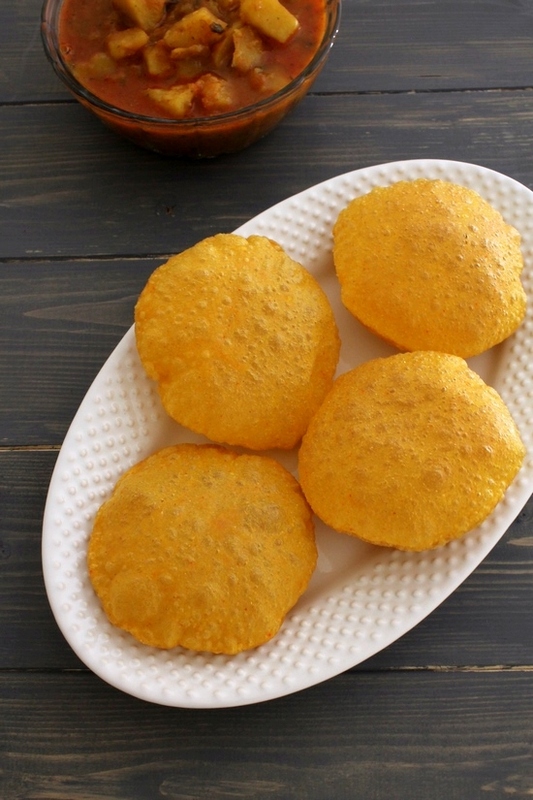 Papdi recipe – This is deep fried, crispy yet flaky flat puris. 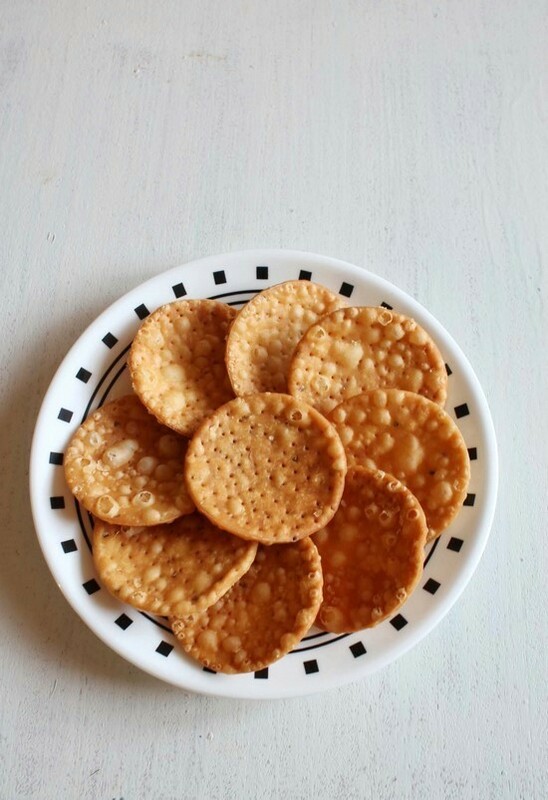 The perfect, simple tea-time snack. 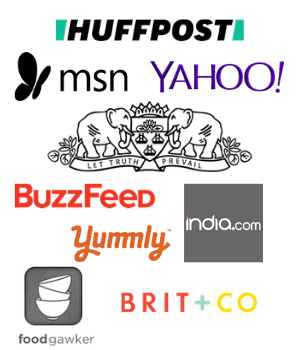 Or these can be used in chaat recipes like papdi chaat, sev puri, bhel puri etc. 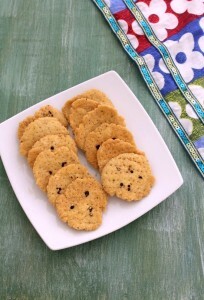 Baked papdi – now the healthy twist here. Even though it is baked into the oven, trust me it tastes too good, not dry, hard at all. And if used in chaat recipes no one will even ever notice that papdis are baked. 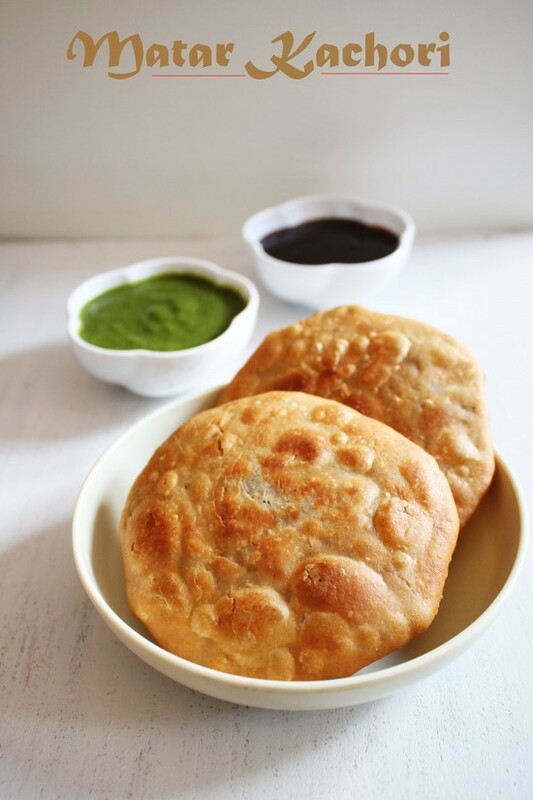 Punjabi mathri – Crispy and extremely flaky, slightly thick textured puris are called mathri in Punjab. Tastes too good with a cup of hot tea or have it with pickle or aloo sabji. Methi mathri – a simple flavor twist on plain mathris. Dried fenugreek leaves aka kasoori methi is added here. 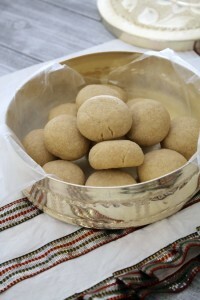 Farsi Puri – Ingredients used in making these Gujarati farsi puri are same as punjabi mathri. But the proportion is different. Because of that the taste and texture is completely different. 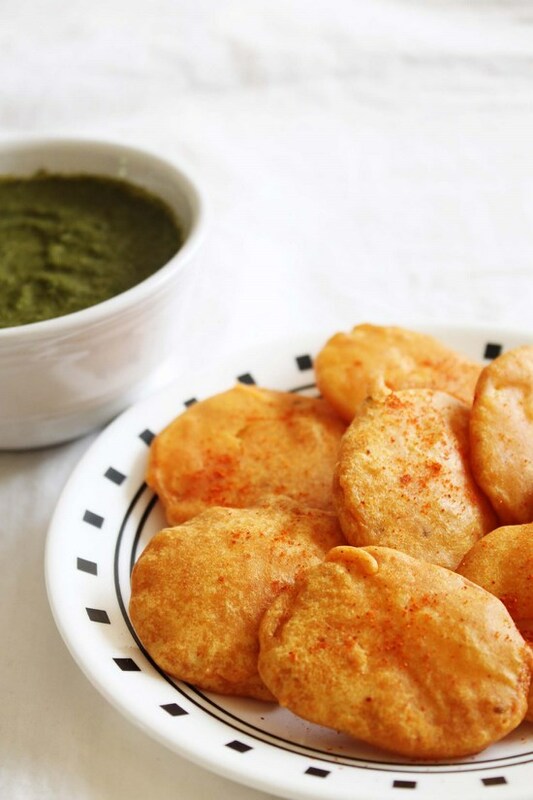 Masala puri – made from whole wheat flour and few spices are added. 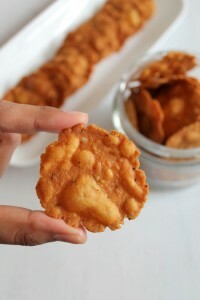 As the name says, these are crispy and crunchy with medium spicy taste. 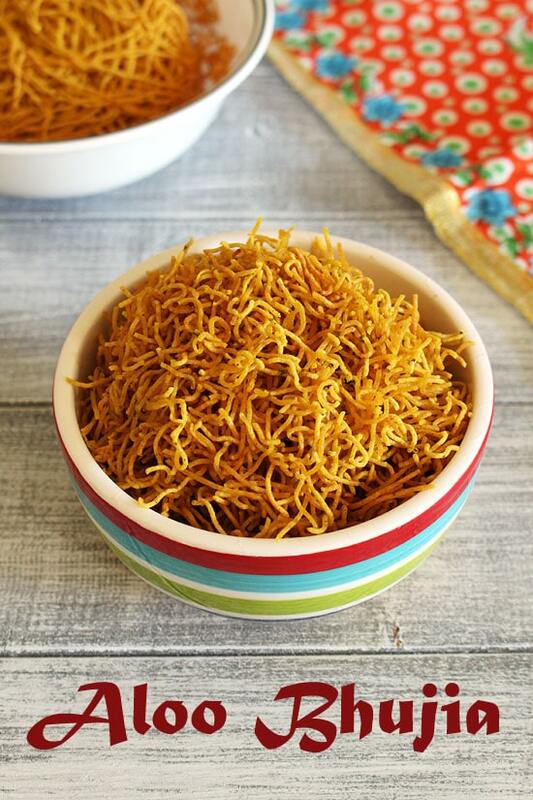 Plain sev recipe – This is plain, simple sev made from besan and seasoned with salt and pepper only. 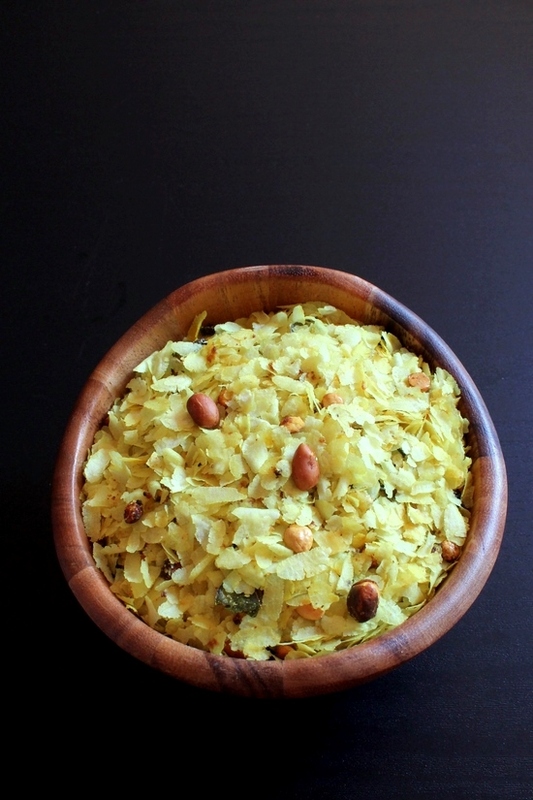 This is usually used in many mixture or chivda recipes, or used in garnishing for many chaat recipes or sandwiches. 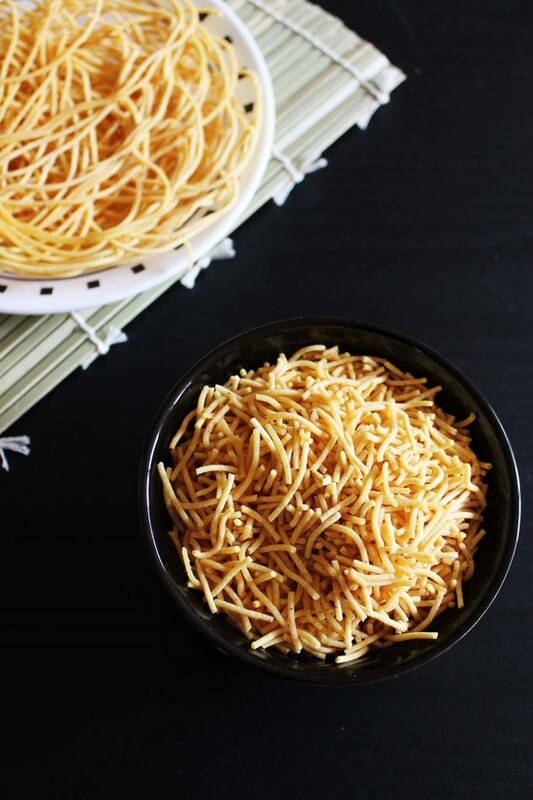 Tikha gathiya – This is Gujarati style of making thick, spicy sev. Here ‘tikha’ means spicy. Aloo sev – Also known as aloo bhujiya. 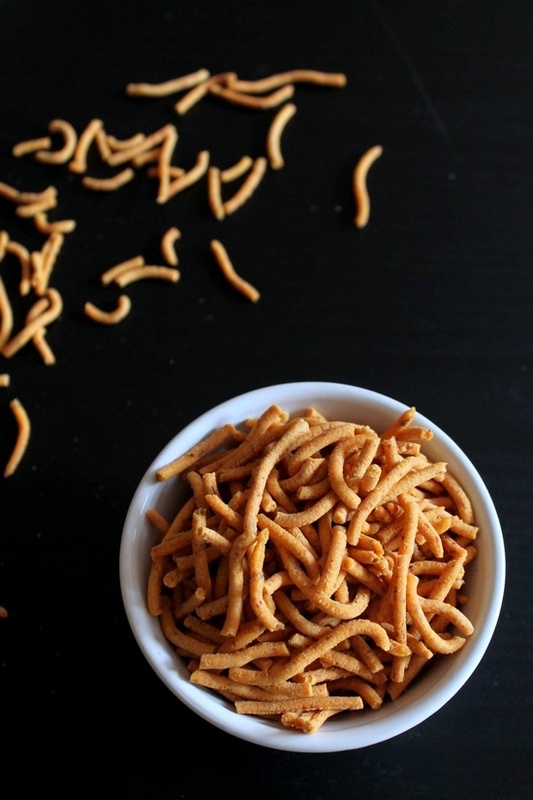 Here the besan sev is seasoned with spices and boiled mashed potato is added in the dough. This one is too good as such or with a cup of tea/coffee. 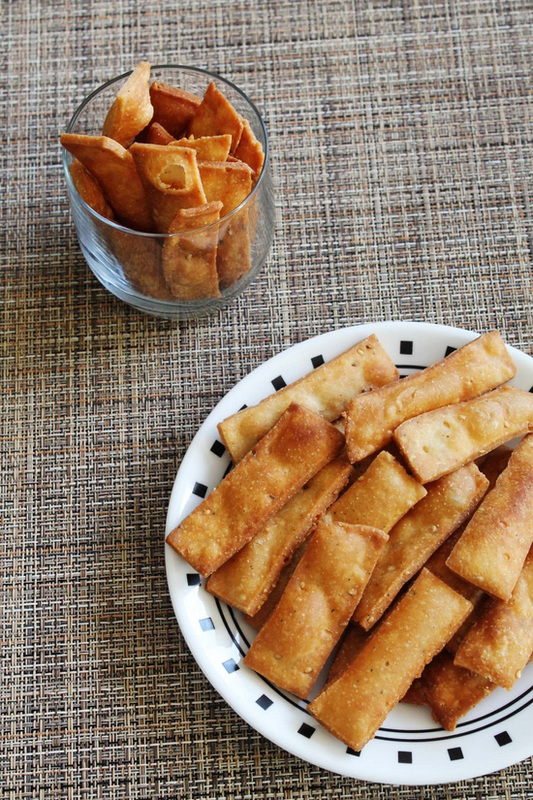 Namak pare – Crispy, slightly flaky, savory namak pare made with all purpose flour. Shankarpali – This is maharashtrian version of sweet paare (shakkar para). It is made from whole wheat flour, sugar, milk. 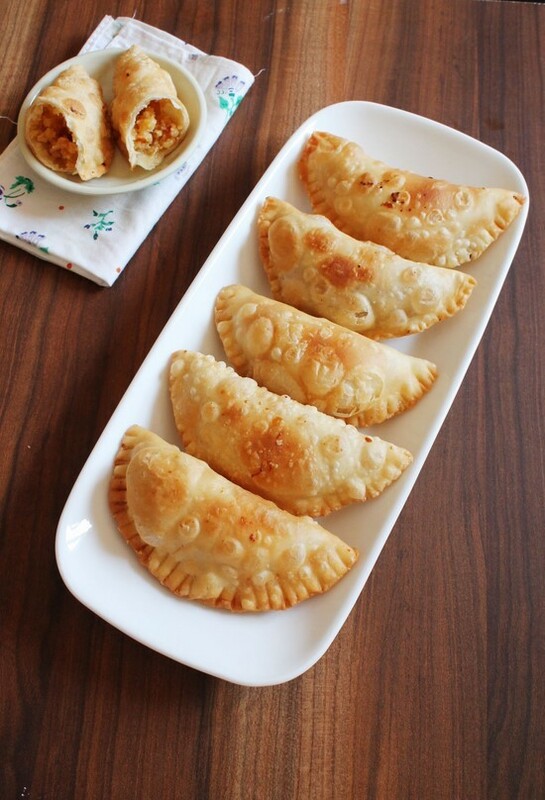 Gujiya – Rajasthani style of mawa gujiya where stuffing has dried fruits, nuts, sugar and khoya. 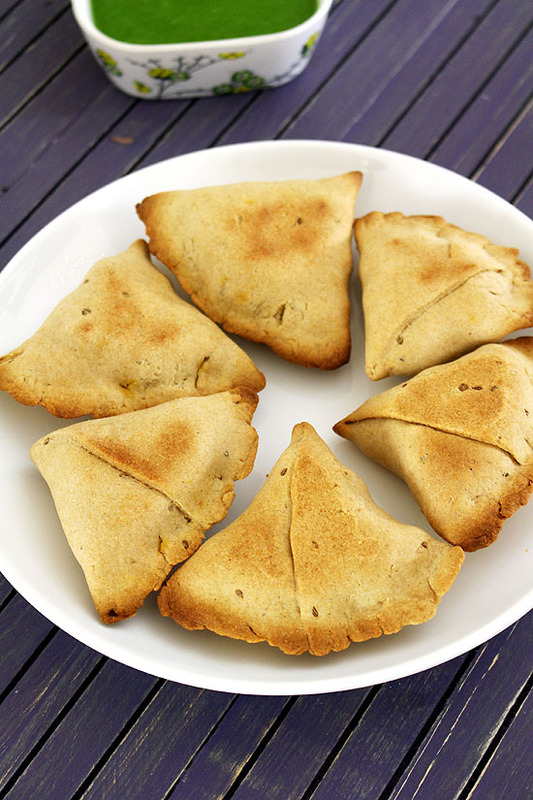 Karanji – Maharashtrian karanji has sweet coconut stuffing with crispy, very flaky outer layer. 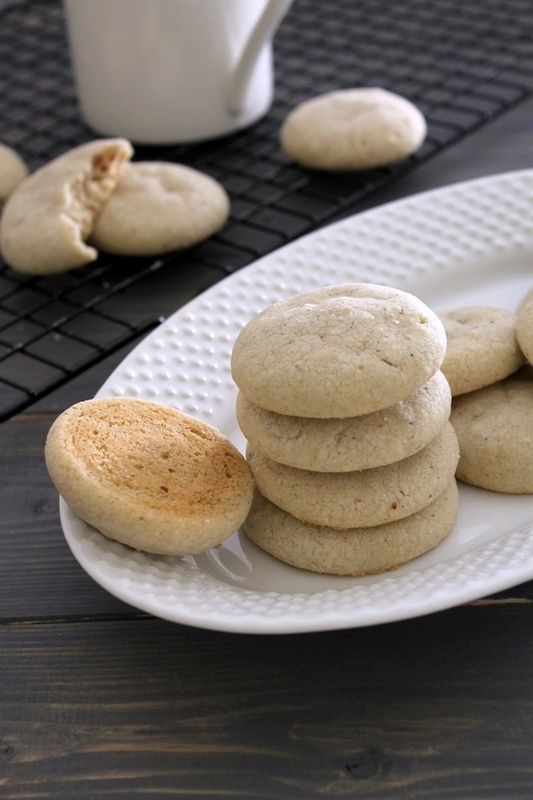 Nankhatai – the good old cardamom cookies, perfect with a cup of a tea or coffee. 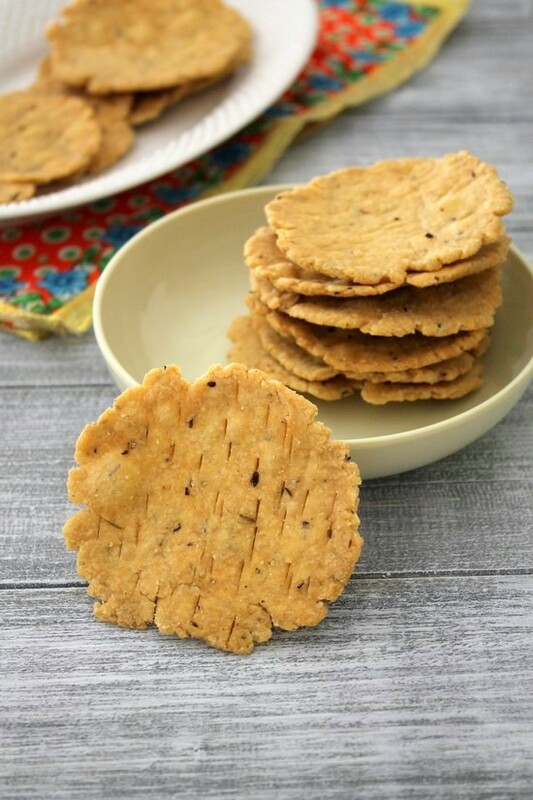 Whole wheat nankhatai – healthy version of traditional nankhatai where maida is replaced with whole wheat flour / chapati atta. 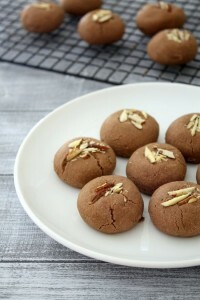 Chocolate nankhatai – Who doesn’t love chocolate? This chocolatey flavor in nankhatai, oh yes!! These below listed snacks should be made freshly and should be served immediately to get the best taste out of it. 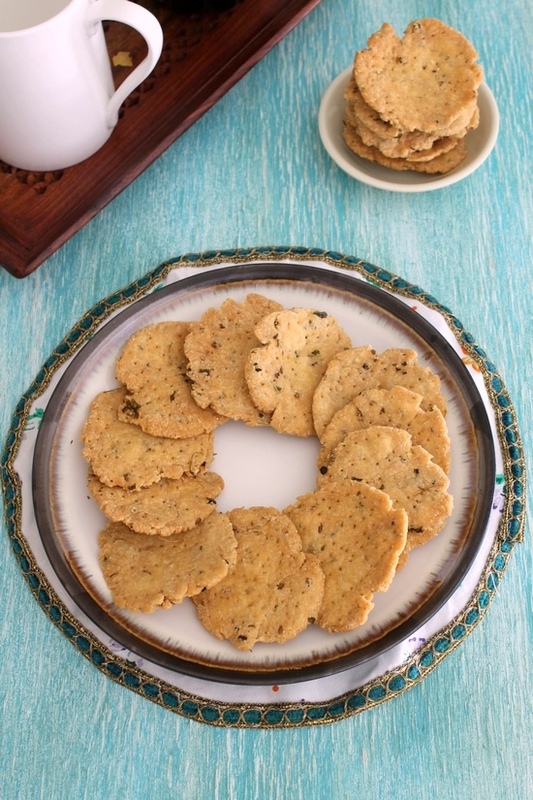 Serve them with coriander chutney, mint chutney or tamarind date chutney. Or serve them with hot cup of tea/coffee. 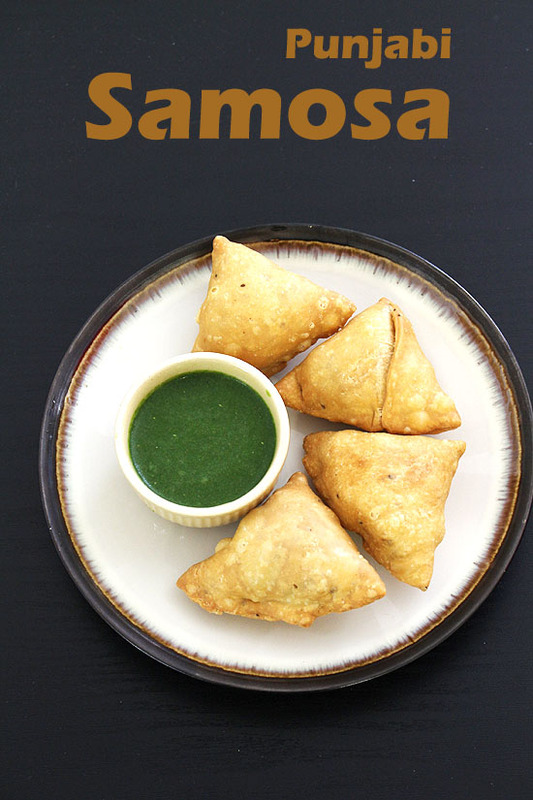 Samosa – Follow this method and you will get PERFECT crispy, flaky outer layer with spicy, delicious aloo, peas stuffing. 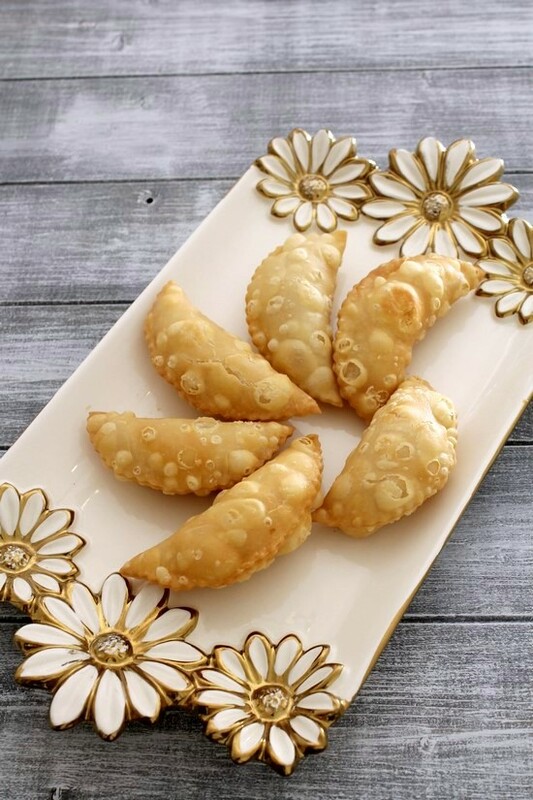 Baked samosa – Looking of healthy option? Try this baked version. Trust me you won’t disappoint. 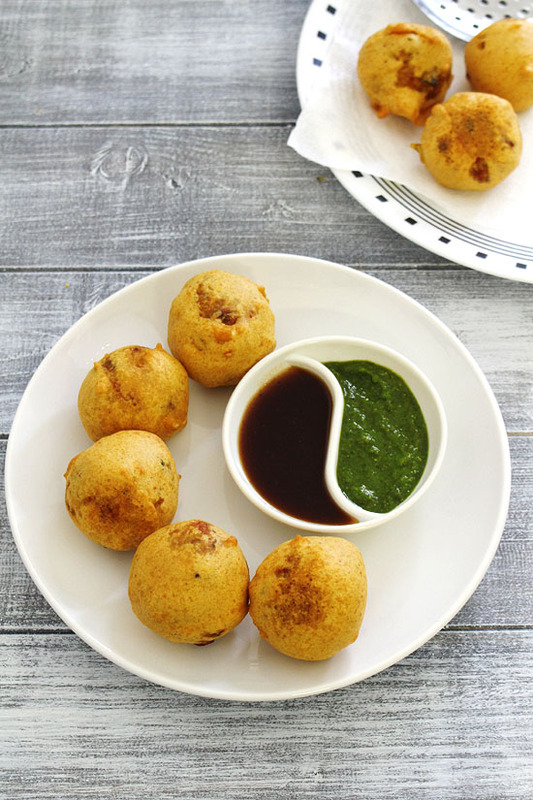 Batata vada – Spicy potato mixture is coated with besan batter and deep fried. This can be eaten as a snack with chutney or tea. Or stuff between buns to make vada pav. 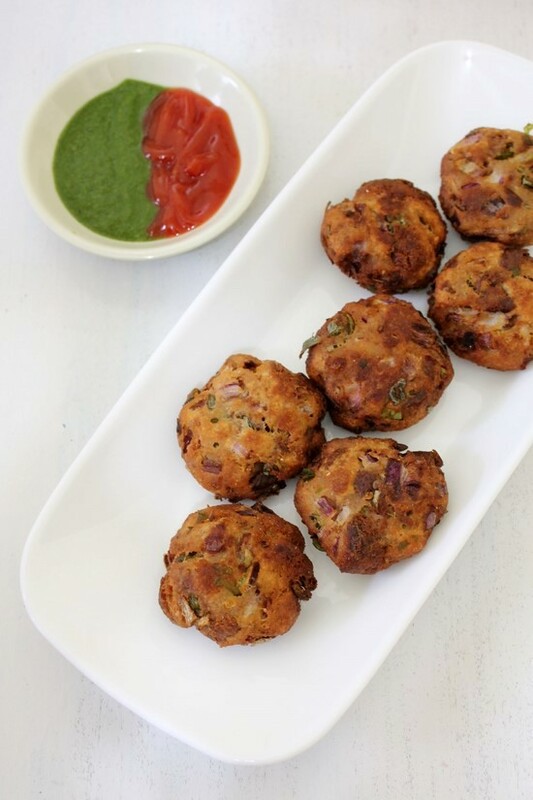 Bread vada – Crispy from the outside and soft from within, these vadas are made from stale bread, yogurt, onion and few spices. 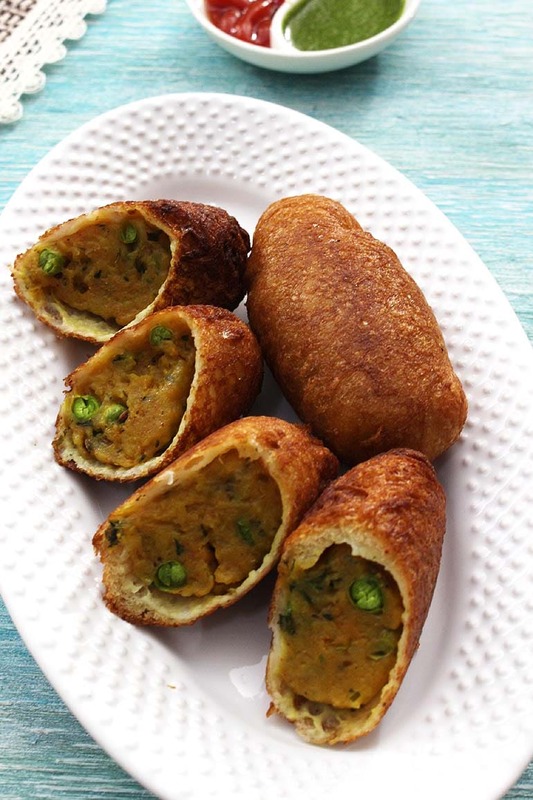 Bread roll – Spicy potato and peas stuffing is stuffed into bread and shaped into roll. Then deep fried till crispy. 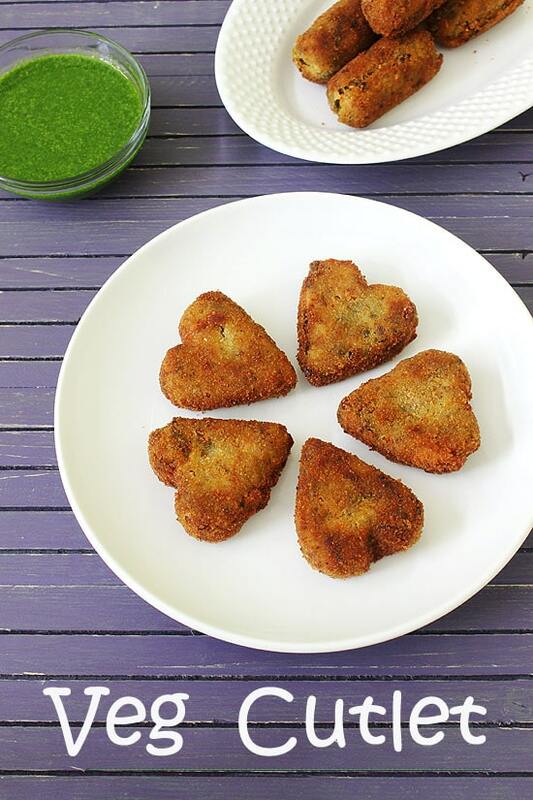 Veg cutlet – Boiled mixed vegetables are combined with spices and breadcrumbs. Then coated with breadcrumbs before deep frying which makes them extra crispy. 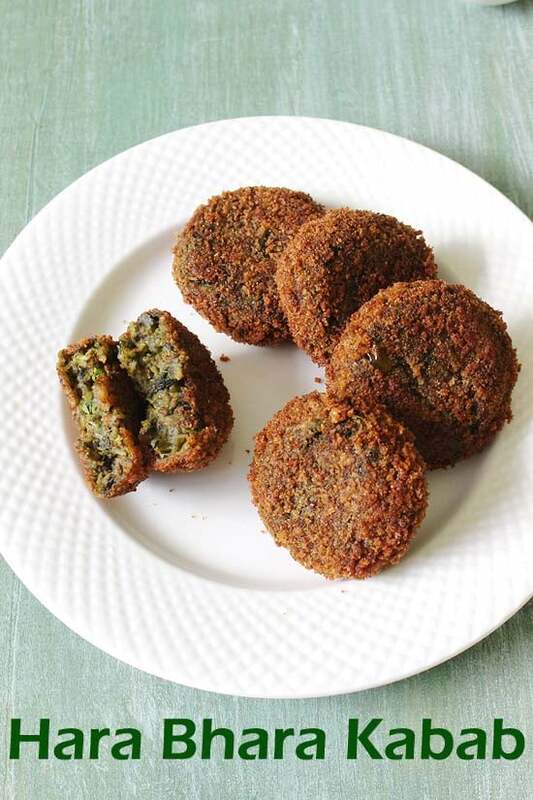 Hara bhara kabab – method is same as veg cutlet, but all ingredients used are green in color e.g. peas, spinach. Hence the name includes hara bhara. 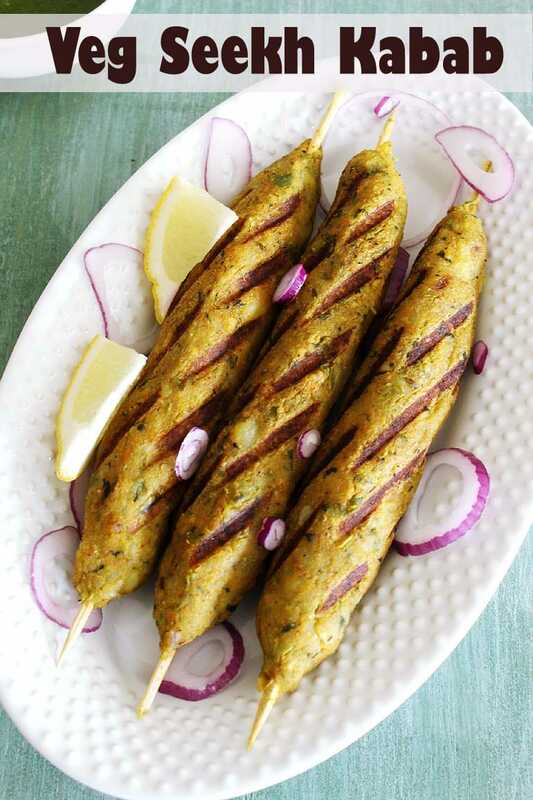 Veg kabab – mixed vegetable and potato mixture is shaped around the skewer and grilled on stove top grill pan or outdoor grill. 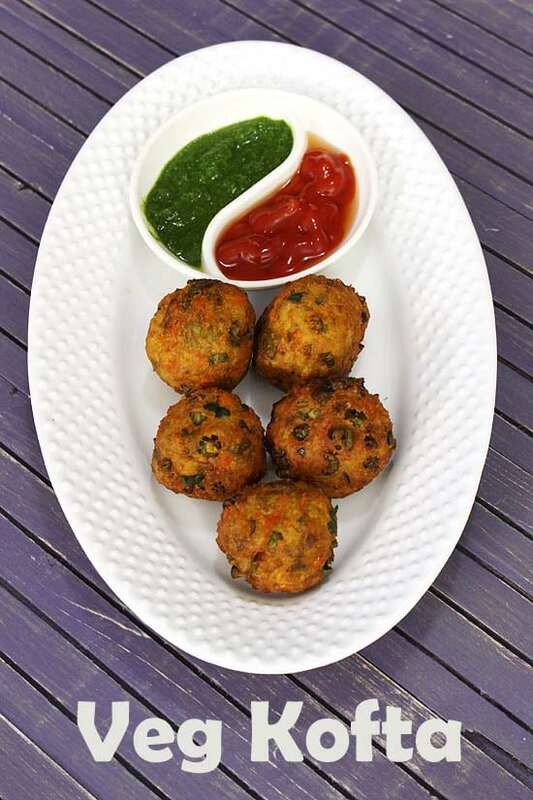 Veg kofta – mixed vegetables are mixed with besan and spices. Then deep fried to make koftas. You can enjoy it as a snack or make veg kofta curry. 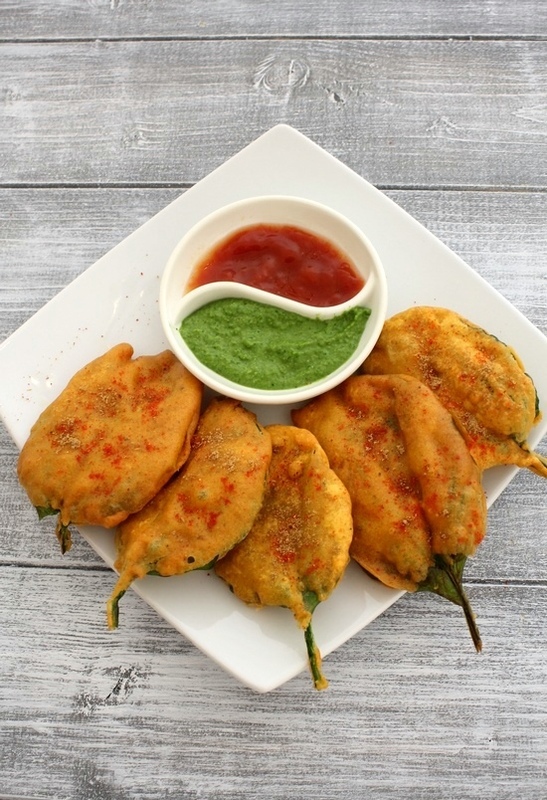 Palak pakora – Spinach leaves are coated with gram flour batter and deep fried to make it crispy. Enjoy as such or make into palak chaat. 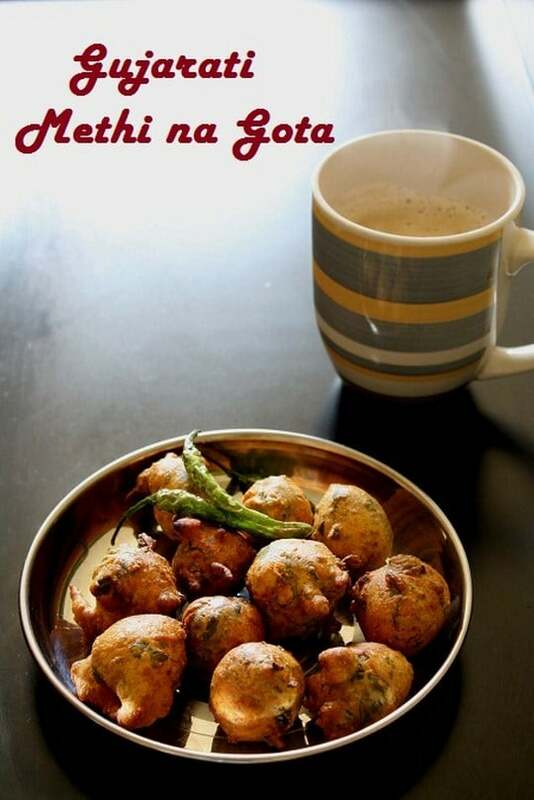 Aloo pakora – good old everyone’s favorite. Potato slices are dipped into besan batter and deep fried. Too good with a cup of tea. 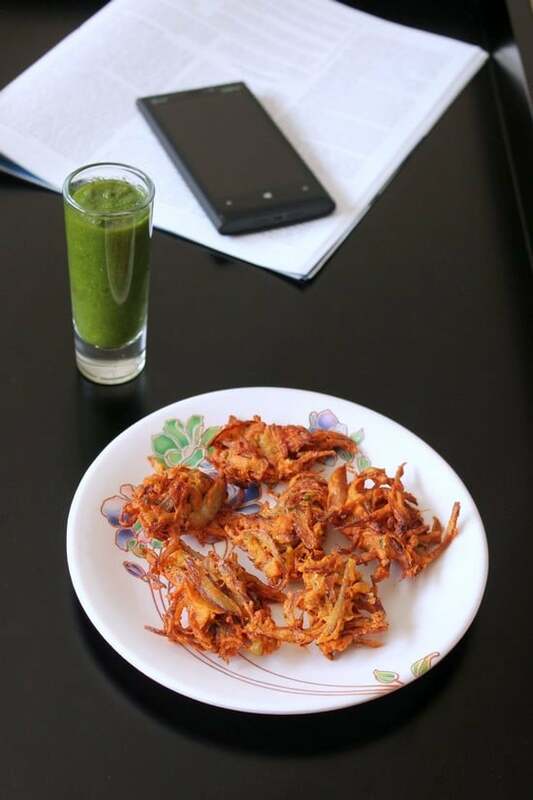 Onion pakoda – Crispy, crunchy onion pakoras tastes too good when served warm/hot. Methi gota – soft, spongy textured gota tastes best with a hot cup of tea. 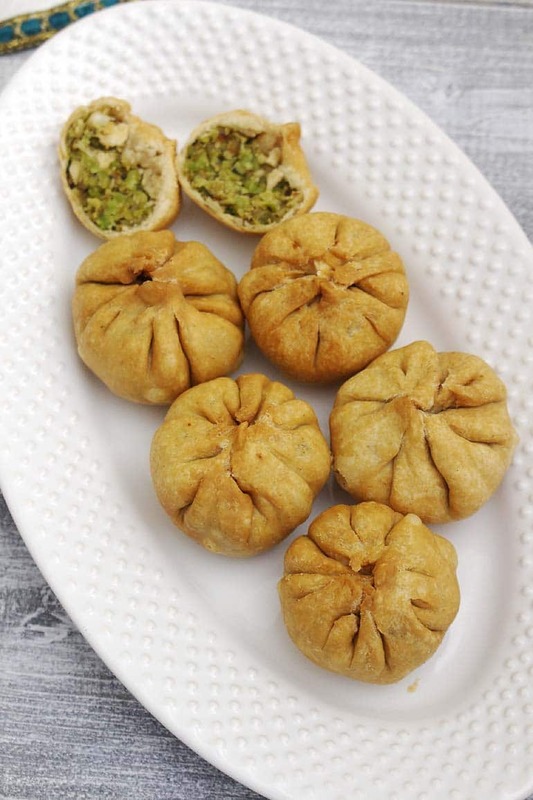 Lilva kachori – traditional Gujarati kachori with fresh turav dana (pigeon peas) stuffing. 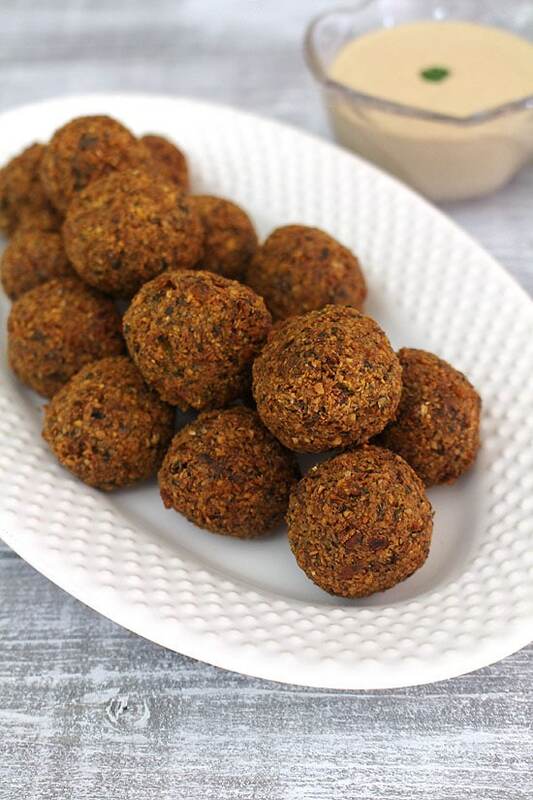 Falafel – This is popular middle eastern street food made from chickpes (kabuli chana). It is served with hummus or tahini sauce. 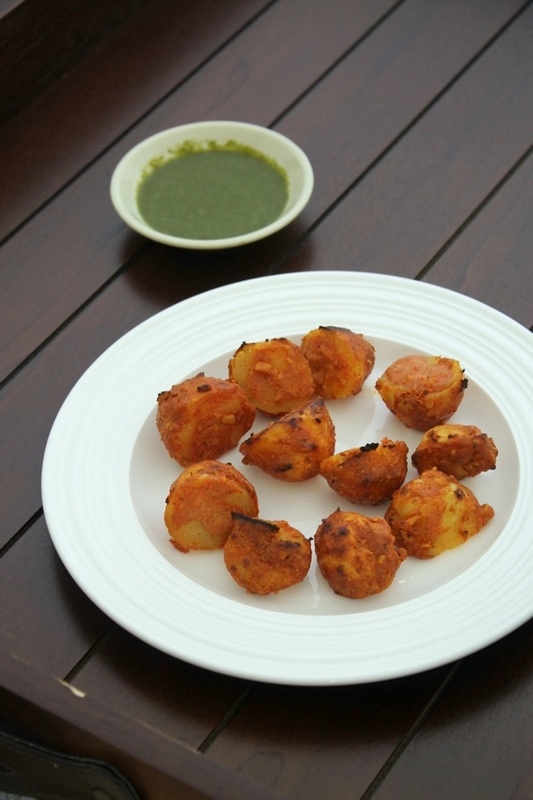 Aloo tikka – boiled baby potatoes are marinated and baked into oven. Yumm when drizzled lemon juice and dipped into mint chutney before eating. 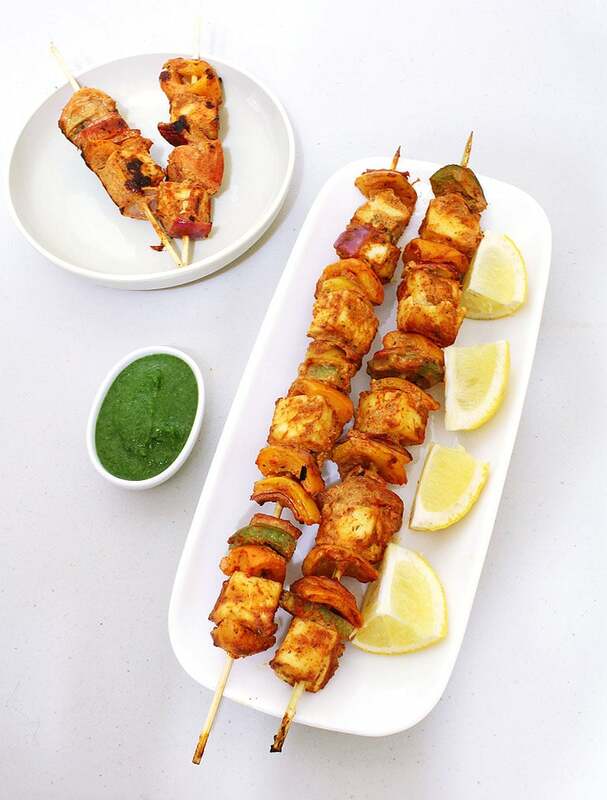 Paneer tikka – most popular tandoori paneer tikka made two ways. One baked into the oven and second shallow fried in pan on stove top. 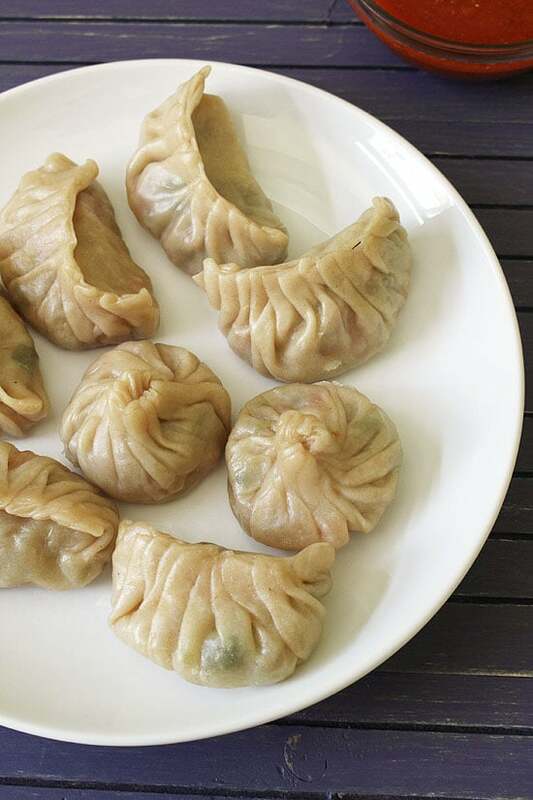 Momos – Mixed vegetable, steamed momos healthy yet yummy when served with momos chutney. 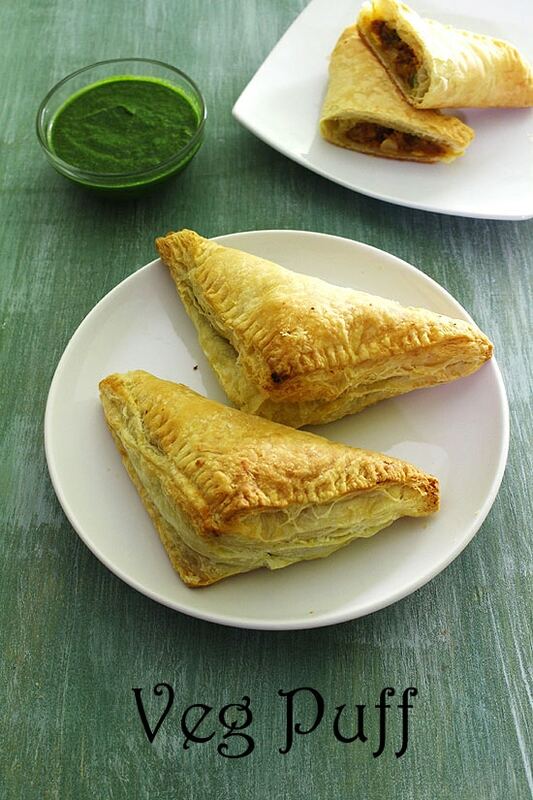 Veg puff – these veg puffs are made with store bought puff pastry sheets. Taste and texture is exact same as bakery ones. The below listed falls in the heavy, indulging breakfast category. This can be eaten as a brunch with your family on the festival days. Pav bhaji – everyone’s favorite mumbai street food. You can also check out the paneer pav bhaji and instant pot pav bhaji. 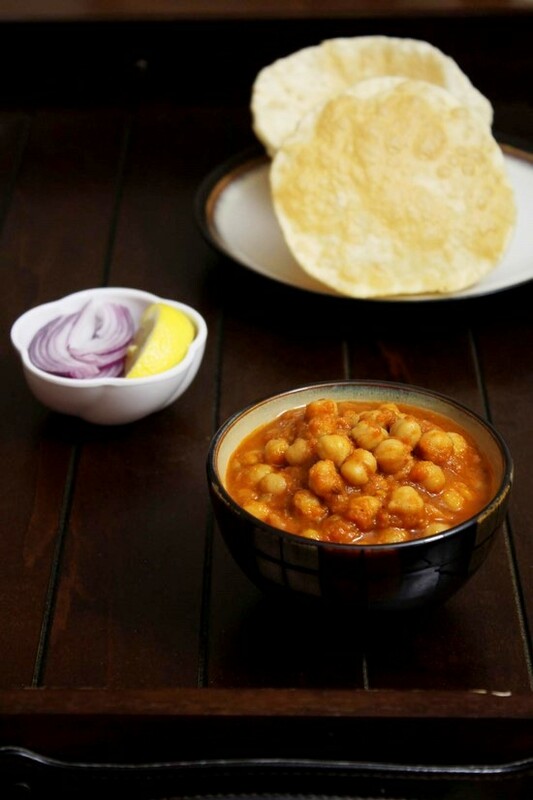 Chole bhature – A big YES to hot hot puffed bhatura with spicy, tasty chole gravy. The whole dish completes when sliced onions, lemon wedge and pickle served on side. 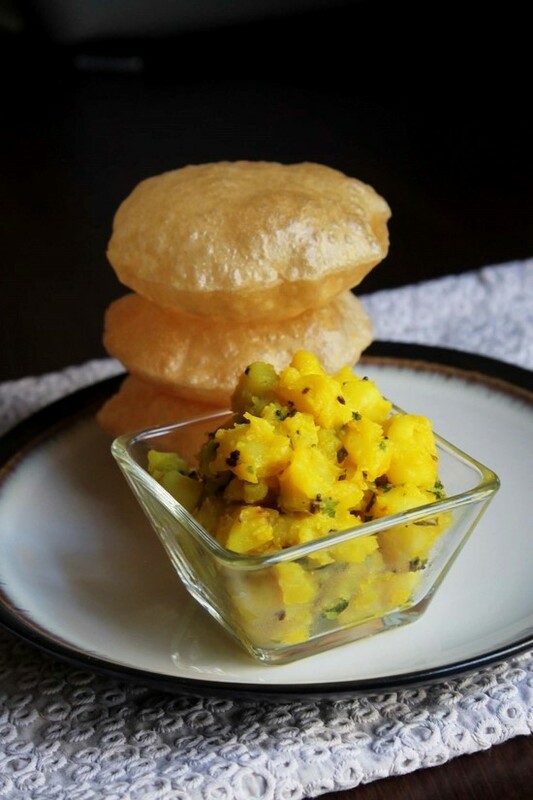 Poori bhaji – Maharashtrian style breakfast where mild boiled potato bhaji served with puffed puris. 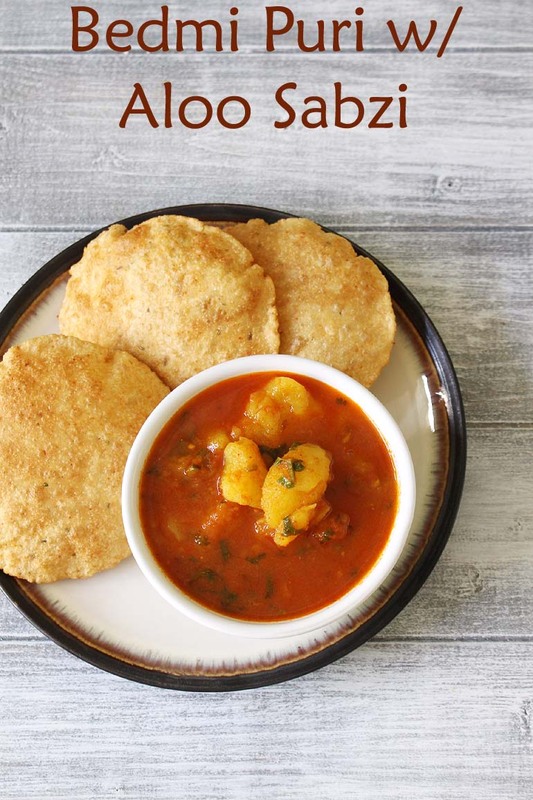 Aloo puri – Punjabi style breakfast where spicy potato gravy served with puris. 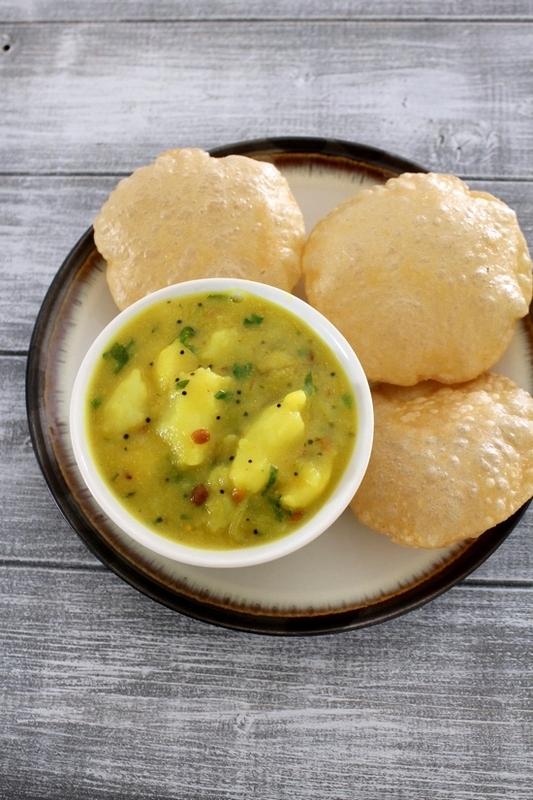 Bedmi poori with bedmi aloo – Now this one is popular in Delhi and Uttar pradesh. Here spicy potato curry served with crispy urad dal puri. 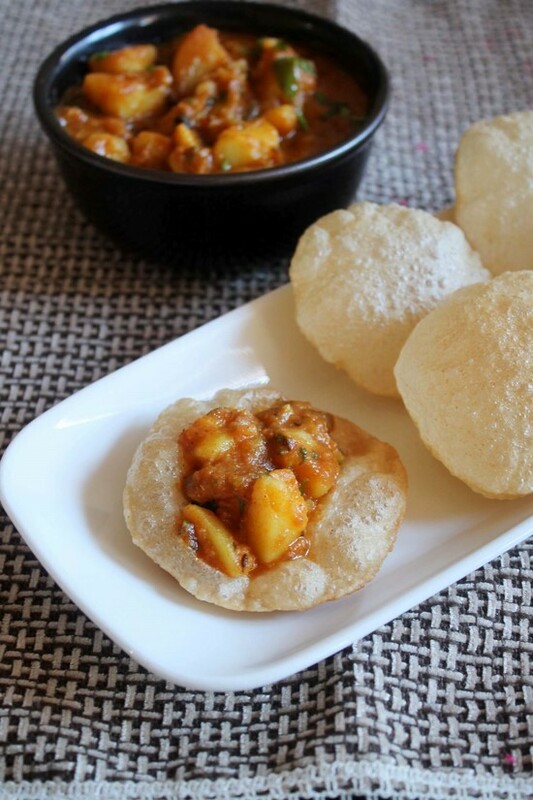 Masala puri with aloo ki sabzi – a variation to above two versions. Poori masala – now this is south indian style mild potato gravy served with puris. Kachori – Delicious, crispy, flaky matar kachoris served with aloo tamatar ki sabji. 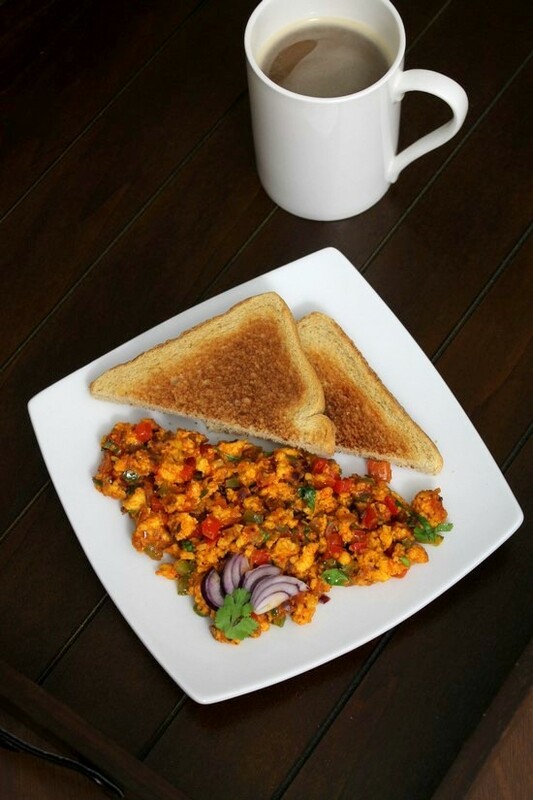 Paneer bhurji – The traditional good old spicy scramble paneer, serve with bread toast. Delicious…recipes. Are they have these many recipes in their festivals? Really interesting to know about this.